The race saw a season-high 14 caution flags wave over the frontstrech in the first Sprint Cup competition on the new asphalt at Kansas. The new surface provided a lot of grip and proved to be a very fast race track, with speeds reaching over 190 mph on the 1.5-mile oval. Chase contender Matt Kenseth claimed the checkered flag and moved up one place to 11th in the points standings. Martin Truex Jr. and Paul Menard finished second and third, respectively. Chase drivers Kasey Kahne and Tony Stewart rounded out the top-five finishers. Hamlin’s Joe Gibbs Racing teammate Joey Logano finished 19th, while fellow teammate Kyle Busch had his day cut short and finished 31st. A solid qualifying run put the FedEx car ninth on the grid to start the day. Adjusting to the new surface under racing conditions quickly proved to give many teams difficulty. The FedEx crew fought for most of the day to make adjustments and improve the car’s handling. By the second caution on lap 71 of 276, the No. 11 car was loose on entry and exit. Crew Chief Darian Grubb called Hamlin to pit lane on lap 72 for right side tires, fuel and a wedge adjustment. Hamlin shot the FedEx car up to seventh place after the restart on lap 77. But by lap 117, the car had tightened up on Hamlin and the team began losing pace. The bad luck continued on lap 122 when Hamlin came to the pits under green flag racing. While stopping for four tires and fuel, a caution flag came out and trapped the No. 11 back in the field. 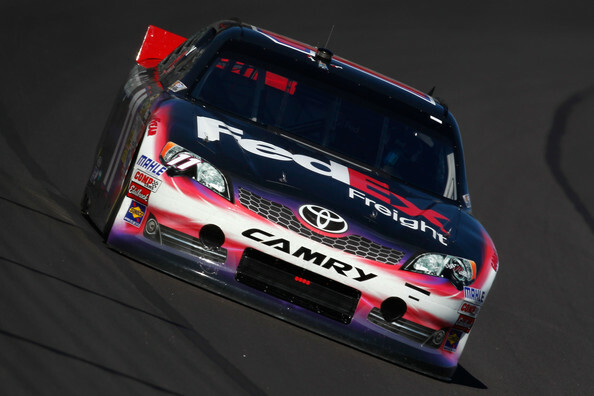 Six laps later the green flag was issued and Hamlin had fallen to 28th place. The fortunes for the team turned around when Grubb seized an opportunity to get back into the race. Under the eight caution flag of the day, Grubb kept the car on the track as many of the leaders decided to pit on lap 155. The move catapulted the FedEx team to second place, just behind the No. 55 of Mark Martin. On lap 208, Hamlin’s fuel window was closing in and the team was forced to pit again under green flag racing. After receiving four tires and fuel, the FedEx machine was back on the track in 25th place. Unfortunately for the team, a caution shortly after provided the leaders a chance to refuel and negated any fuel window strategy. Now in the late stages of the race, Grubb radioed to Hamlin to race as hard as he can to make up ground. Hamlin piloted the No. 11 through traffic and got the car to 18th place by the last pit stop of the race and under what was the final caution flag of the day on lap 236. With 17 laps to go and only 25 cars remaining on the track, Hamlin fought to maintain position and salvage as much as he could from the yellow flag-plagued race.